What if you could pluck lettuce, cucumber and tomato from the rooftop farm in your residential building to prepare a salad that is fresh and pesticide free? And that, too, from plants grown without the use of soil? Well, it could be a common sight in the near future. The Food and Agriculture Organization (FAO) of the United Nations estimates that by 2050, agriculture production must increase by 70 per cent to feed the ever-increasing population. India will be one of the world's top food importers if we do not try out every futuristic technology that can increase productivity by using less water and less or no soil, apart from reducing health risks to near zero. Rising demand for fresh and pesticide-free horticultural produce for perennially-swelling urban population all over the world is resulting in the introduction of new farming techniques. These include soil-less techniques such as Hydroponics, Aeroponics and Aquaponics that will redefine commercial agriculture. Soil plays a key role in growth of plants. It supports the plant, provides it nutrients, and holds moisture, organic matter and bacteria. Well-ploughed land means good oxygen circulation to the root zone. The new techniques provide all these things to the plants without using soil as the medium. The word Hydroponics is derived from two Greek words, 'Hydro' (water) and 'Ponics' (to labour); so, it means putting water to work. In this, the roots of the plant are either submerged in water or in sterile and inert material. The nutrient salts are provided by dissolving them in the water. These salts are natural substances purified by fractional crystallisation, making them technically inorganic. There are different methods that suit specific plant varieties. While Nutrient Film Technology and Deep Water Culture are commonly used for green vegetables, Substrate-Based Hydroponics is often deployed to grow vines of tomato, cucumber, etc. Commercial Hydroponics farms are usually set up over more than one hectare for optimum use of resources. The Hydroponics technology ensures consistent taste, shape and colour of the produce. The yield is high and predictable and free from soil-borne diseases. Besides, unlike the traditional open farms, commercial soil-less farms are immune from environmental changes. They also use almost 90 per cent less water. 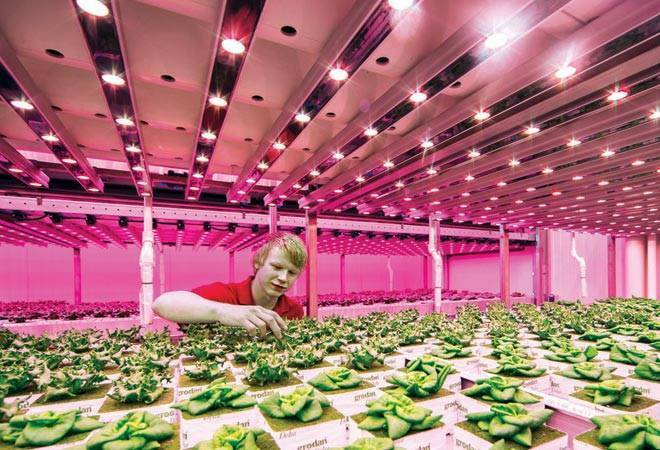 Further advancements in artificial lighting, ways to provide nutrients, pest management and building the systems vertically could multiply the yield of Hydroponics farms to tens of times the traditional farming yield. In Aeroponics, plant roots are suspended in the air, and moisture and nutrients are provided through foggers. This provides most oxygen to the roots, making the plants grow faster and produce more. Aquaponics, on the other hand, involves replacement of nutrient salts with water from aquaculture, a method of growing a lot of fish in a small area. In other words, it finds a solution to the biggest challenge of aquaculture - the generation of ammonia from fish excreta, whose high concentration can be toxic - by allowing bacteria strains to convert ammonia into nitrites (also toxic to the fish) and to nitrates (less toxic to the fish). Nitrates, a major nutrient for the plants, are taken up by the plant roots. The water so cleaned is used for aquaculture. Vertical farms are located in the centre of cities where space is available at a premium. These are built over a smaller carpet area but designed to grow vegetables in multiple layers. These farms generally employ the Aeroponics technique but Hydroponics and Aquaponics are used as well. Reduction in carbon footprint (vegetables are transported over hundreds of kilometres, adding carbon to the environment), conservation of water (sometimes condensed water from air-conditioning units is used), freshness/safety of the produce, and premium prices are the common considerations behind vertical farming. Worldwide many enthusiasts and agripreneurs are running successful vertical farms with more and more innovative ideas. There is no limit to these farms. They can go as high as you can pump water and access the place, either yourself or through a robot. The Association for Vertical Farming (AVF), an international NGO, is working with many farms to spread the technology. From Middle East to South-East Asia to Japan to USA to Europe, commercial soilless farms are producing quality and insecticide- and chemical-free produce. South Asia, however, has been slow in adopting these new technologies.